It is usually more convenient to stop down the rear lens, but that practically guarantees that the light rays forming the image have been selected from the worst sections of the front lens. Unless you already know what's going on, it's probably hard to understand those words. So here are some illustrations. 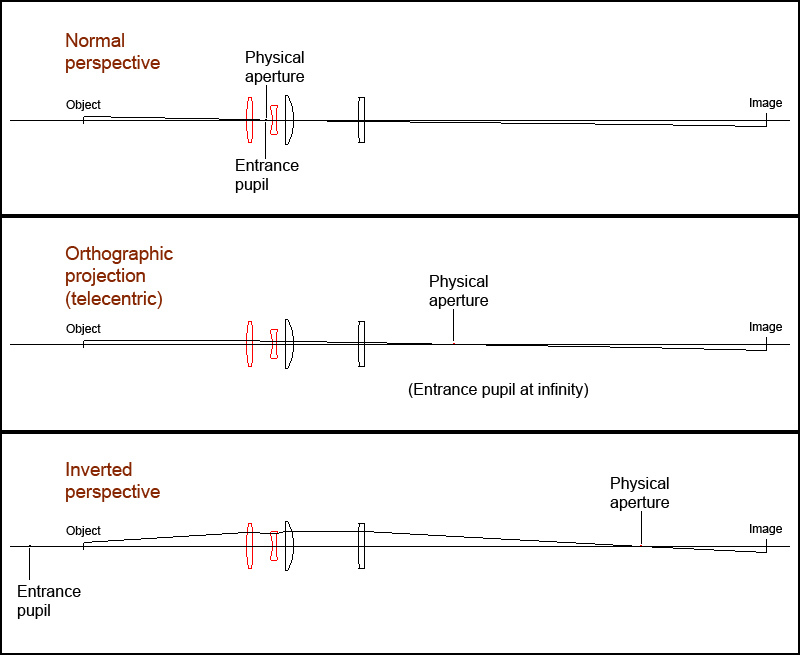 First, here is an overview diagram of the lens system I'll be using. From left to right, we have an object, a triplet acting as the "Front Lens", a singlet acting as the "Rear Lens", and an image. The focal lengths and distances are set up to give 2:1 magnification. Now, zooming in on just the lenses, let's consider what happens when we stop down at various positions. Nothing changes except the stop position. 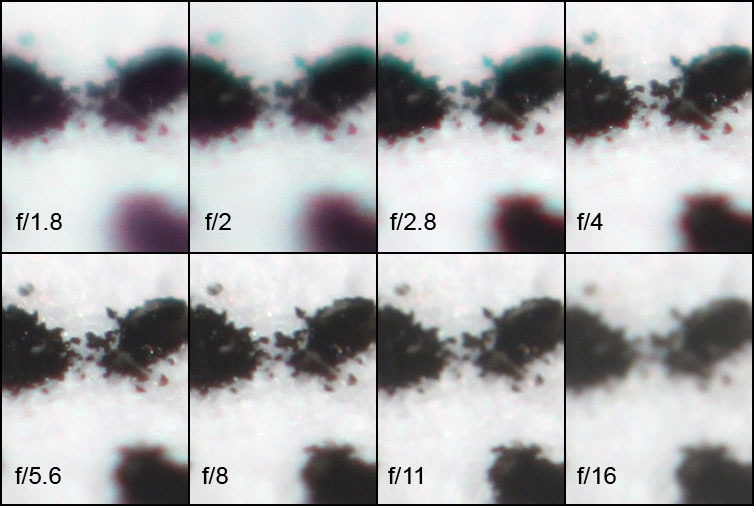 Comparing the two images above, it should be apparent that stopping down at the rear lens selects rays that have gone through more peripheral areas of the front lens. (Note especially the strong concave element in the middle of the triplet.) For the on-axis ray bundle, the stop position makes no difference, but off-axis bundles are pushed into more peripheral sections of the front lens. If the stop is placed even farther back, as it would be with real rear lenses, the effect becomes even more pronounced. Conversely, stopping down inside the front lens causes off-axis ray bundles to pass through more peripheral parts of the rear lens. An optimal stop position would compromise between these effects, placing the stop in some intermediate position so as to avoid the extreme periphery of all lenses. Unfortunately, the stop position that would give the best image quality is also the least convenient because commercial lenses certainly don't have a diaphragm at that position and in many cases the optimal position is not accessible to add one. Edit: July 21, 2010, to change title and move this topic to become a FAQ. Here is an illustration of how important it can be to stop down a combo at the proper place. For the front lens, I'm using an old Mamiya Sekor 55 mm f/1.8 lens. For the rear lens, it's the Canon 55-200 mm 1:4.5-5.6 II kit lens that came with my 300D. The rear lens is zoomed to 200 mm and set to closest focus, giving the setup about 3.8X magnification from lens to sensor. The target is bunch of laser-printed dots, tipped back about 45 degrees. Here's the target, with the front lens stopped down to f/16 (effective f/61). Notice the two outlined areas, one near image center and one near left edge. We're going to look closer at those parts as I change aperture settings on the front and back lens. At image center, the above photos illustrate that there's almost no difference between stopping front and stopping rear. It's pretty obvious, I think, that this particular combo looks pretty good if one stops down the front lens, but looks like complete junk if one stops down the rear. Stopping down the rear lens introduces a lot of transverse CA, and the resolution never does get decent at the edge. Not all combos will work this same way or to this same extent -- it depends on the details of the lenses. But it should be obvious that stopping properly can have a huge effect on the result. By the way, it's interesting to notice that this combo exhibits quite a bit of longitudinal CA. 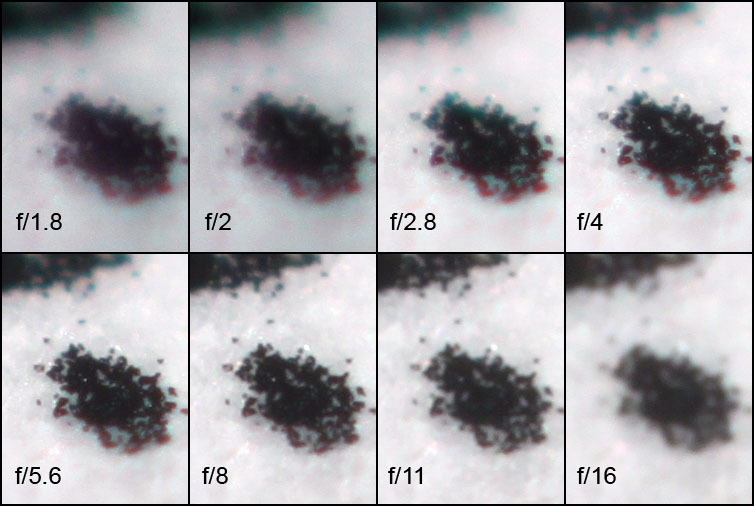 You can see in the first row of photos that dots in front of focus have red halos, while dots behind focus have blue. This effect is most obvious at wide apertures and diminishes as the lens is stopped down. The crops are actual pixels at 4752x3168 from a Canon T1i camera, sensor size 22.3 mm x 14.9mm. Edit: to correct the calculation for effective aperture, "multiply by 4.8" --> "multiply by 3.8"
Wow, I can't thank you enough for this Rik! I've been trying to get my head around this many times and I always end up in confusion. Now it makes perfect sense! You're very welcome. I know that feeling all too well. I've had to spend lots of time coming to grips with what apertures do. By "lots", I mean literally weeks of full-time confusion. If I can help somebody else get it faster, that's great! There's one more aspect of combos and apertures that I want to cover before we close out this topic. This is the same setup I've been using up above to illustrate effects on CA and resolution. But now I want to talk about geometry. Here are two pictures that may make your head hurt. They're straight out of the camera except for being resized. There's no change to any of the optics except which lens was stopped down. And no, that right-hand image is not flipped. That's correct -- stopping down the rear lens causes inverted perspective, so that things closer to the lens look smaller. What's going on is that moving the position of the limiting aperture changes the position of the entrance pupil. 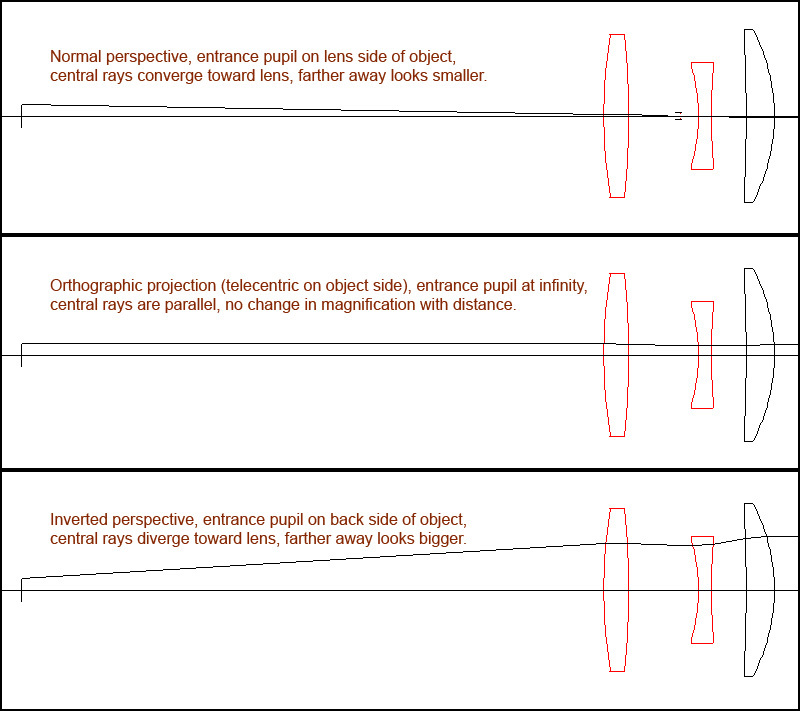 In the first case, stopping down the front lens puts the entrance pupil in the middle of that lens, resulting in a normal perspective where things that are closer to the lens look bigger. In the second case, stopping down the rear lens essentially puts the entrance pupil way in front of the front lens, actually on the back side of the focus plane. Things that are closer to the entrance pupil still look bigger, as you might expect when I say it that way. But because the entrance pupil is on the back side of the focus plane, this means that things look bigger when they are farther away from the lens. Magnification increases with distance from the lens! This probably all seems like something from Alice in Wonderland. But perhaps a few ray diagrams will clear things up. Here are the overview pictures. Zooming in on the object and the lens makes it easier to see. If this still seems a bit like Alice in Wonderland, be assured that it's really all very simple. Any aperture just selects a subset of all rays that would otherwise pass through the lenses. Those rays form the image, so the image has whatever geometry corresponds to the rays that got selected. In the absence of the aperture, rays are collected corresponding to many different perspectives -- a whole spectrum of them ranging from normal to orthographic to inverted. Moving the aperture back beyond the telecentric position simply selects rays that correspond to a geometry of inverted perspective. See this article for more discussion and illustrations of that concept. Again, not all combos will act this same way. It depends on details of the lenses. But most of them will, to some extent. What's required is only that the aperture of the rear lens appears to be located farther back than one focal length of the front lens. For the case shown here, the zoom that I'm using as rear lens has an aperture that appears to be very far back, actually behind the lens mount. Of course that's not where it is physically located, but what counts is where it appears to be, looking through the glass in front of it. Edited to add: These ray diagrams came from LINOS Photonics WinLens 4.4. That's a free download available from http://www.winlens.de/. I see it's also obsolete, apparently having been replaced by WinLens 3D. Progress never stops... The triplet in this model combo is WLTR001 from their standard library. I especially appreciate the experimental tests of the various aperture combinations. This well-balanced use of theory, conceptual explanations, and controlled experimental testing is so delightful to read and to study. Thanks for the feedback -- most appreciated. I'm a bit boggled, but very interesting stuff esp as someone who advises use of a reversed lens on another one with it wide open and focused on infinity (I do say normally though). Yeah, combos are a can of worms. On casual analysis, every combo should work wonderfully. After all, both lenses are being used in an as-designed focus relationship. Ordinarily, you would expect that to be an ideal situation. But the devil is in the details. 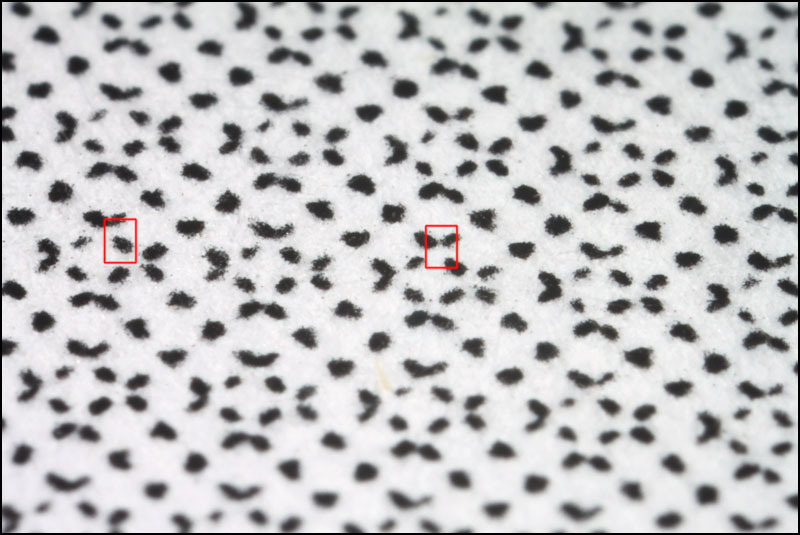 In this case, the details are the apertures. As illustrated above, the apertures may select light rays that have gone through portions of the lens that the designer did not expect to be heavily used. 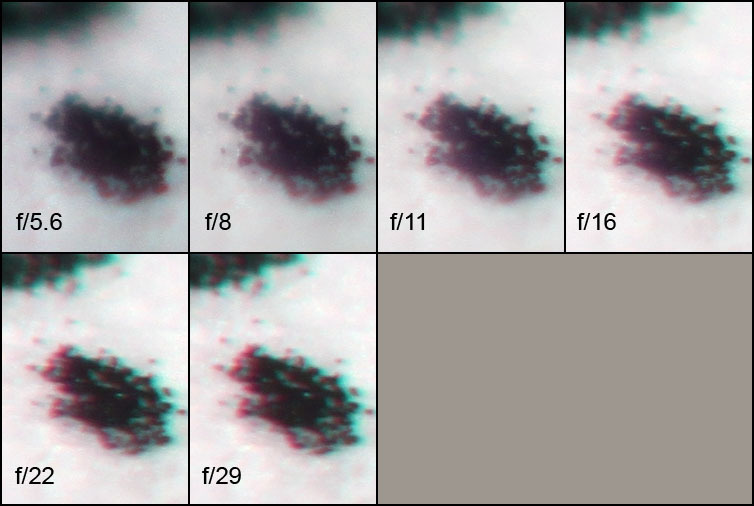 In the example shown, stopping down the rear aperture means that the edges of the image are formed only by light rays that went through peripheral portions of that f/1.8 lens. It should be no surprise that those portions are pretty bad -- if they were good, the manufacturer would have widened the lens to be f/1.4 and sold it for a higher price. So why do combos have such a good reputation? Personally, I suspect it's a case of "media bias". Every once in a while, some combination happens to work splendidly. That one gets a lot of good press, which prompts other people to try combos too. Most of those combos probably don't work very well, but nobody's eager to publicize their failures because, well, they're failures! Absent some pretty good explanation about why the combo didn't work, the problem could just as well be a failure of the photographer and not the equipment. A perfectly reasonable response is "Hhmm, maybe I'll just keep quiet on this issue." Hence the legend lives on. Sometime I would be interested to see an unbiased accounting of combos: try all pairs of a zillion different long and short lenses, tabulate the results -- all the results -- and see at least what the odds are. My prediction is that most of them won't work very well. But I could be wrong, and that would be an interesting thing to know. Well, Rik, I see you're just full of useful information (seriously)! Thanks again for linking me to this discussion. I had heard in passing a few people talking about stopping down the reversed lens. And I've only tried it once without much success, but I want to try again. Two things: 1) Do you mind telling me how you measure the aperture opening of the reversed lens? And 2) How are you keeping the aperture opening set to whatever f/stop? I shoot my reversed 50 wide open. The only way I've known to keep the diaphragm open is to insert a small piece of folded paper into the aperture ring lever (image below). The only time I tried to control this aperture opening otherwise was to try for a rough in-the-middle-of-the-road opening. The aperture range on the 50 is f/1.8 - f/16, so I folded a smaller piece of paper trying to get somewhere around f/9 - f/10, but clearly I don't know how to measure it. The result were terrible compared to what I expect so I never tried it again. I uploaded an image to the forum gallery page to demonstrate what I typically get with my standard method of shooting the reversed lens wide open with the main lens at f/16. I can get closer but I backed off the focal length of the 85mm main lens a bit for composition. 1) Do you mind telling me how you measure the aperture opening of the reversed lens? The most general method is to measure the diameter of the pupil and divide that into the focal length of the reversed lens. See HERE, in the FAQ: What is "pupil ratio" and why would I care?, for details about how to make the measurement. 2) How are you keeping the aperture opening set to whatever f/stop? It varies depending on lens type. The lens that I used for illustration dates back to the 1960's and includes both an auto/manual switch and a ring for setting the aperture. With that lens it's just a matter of flipping the switch and turning the ring. For Nikon lenses, I guess the adapter linked by Saul is probably the best approach. I haven't worked much with reversed Nikon lenses, so I'm pretty naive about them. 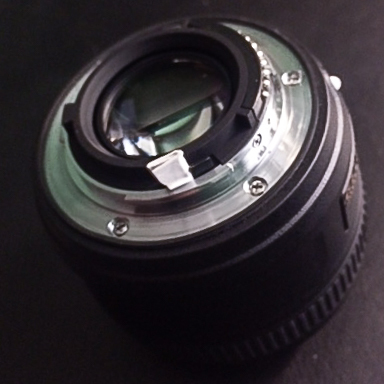 Modern Canon lenses have diaphragms that can only be controlled electronically. Those used to be settable only by using a scary procedure that involved physically removing the lens while the camera is powered on and the DOF preview button is held down. (See HERE for discussion of that.) These days there is an off-the-shelf adapter that can be used to both stop down and control the lens focus motor. 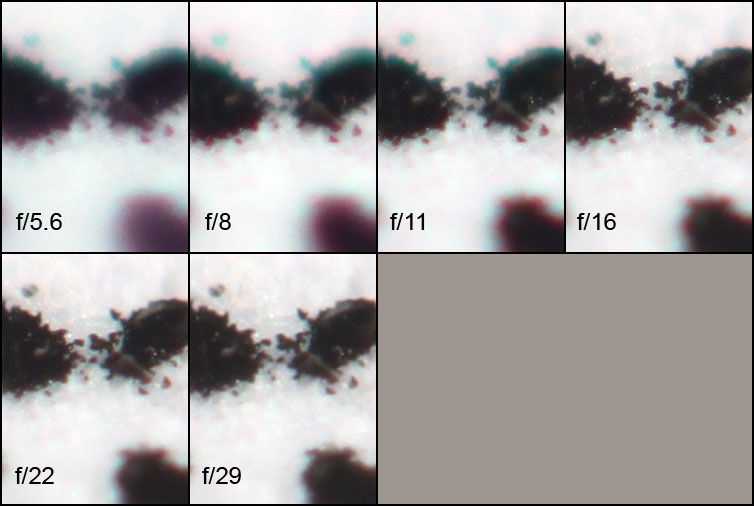 See Fly stacked by AFM w/ reversed 18-55 using MK-C-UP adapter for more about that. One other thing to remember when setting aperture on the front lens is that there's a big difference between setting f-numbers on the rear lens and on the front lens. On your Nikon camera, the f-number that you set on the rear lens is probably the "effective aperture", already corrected for lens extension. In that case f/16 will be slightly into diffraction territory for most current sensors. But when you set aperture on the front lens, you have to account for magnification yourself. At 3.8X, as in the setup that I used for illustration in this thread, that turns f/10 on the front lens into effective f/38, which will give a lot of diffraction blur. Notice in the image panels HERE that setting f/8 on the front lens gives the same blurred result as setting f/29 on the rear lens. At higher magnifications, you'll be wanting to use wider settings on the front, probably more in the range of f/4 - f/5.6 than f/10. Saul, Thank you for the link. That's definitely going to help! I noticed there are no f/stop markings on the device, which would obviously vary from lens to lens, so I'll have to work out the graduated f/stops myself. Do you have any experience with putting marks onto a device like that? Maybe just using small paint dots? At higher magnifications, you'll be wanting to use wider settings on the front, probably more in the range of f/4 - f/5.6 than f/10. Maybe just using small paint dots? Narrow lines, just about, but the whole range is covered in a very short distance. If you don't need to keep opening the lens to full aperture you can use a "calibrated" matchstick to hold the aperture lever. I have a Nikon-G to Canon adapter, which has a radial lever to move the one in the lens. when you stop behind the front lens, you reduce the NA (I undesrtand the NA is defined by the angle of the most outer rays), that would seem, theoretically, to be more damaging to the resolution than stopping behind the back lens. Perhaps the blur you get by stopping behind the back lens could be removed by using monochromatic light?